Each week, I recommend two podcasts that you should listen to. Go here to find out how podcasts changed my life. With only thirteen episodes so far, The Fogelnest Files is still but a nascent enterprise on the highly popular Earwolf Podcast Network. However, those twelve episodes have made me smile more than most long-running podcasts. My smile is not just from the humor (for which there is plenty), but for the appreciation of host Jake Fogelnest's deep love and amazing ability to curate some of the best gems of pop culture past. Each week, he picks several YouTube videos to watch based on a theme (politics, rock music) and he and the guest comment on them. Watching videos with someone may not be your first pitch for a podcast, but it works (and he posts the list of videos for each week to watch before/during/after listening to the podcast). The clips are sublime. Whether it's watching obscure band Manakin, watching Hilary Clinton attack sexist remarks, or introducing folks to the Beaver trilogy, they are always lead to great conversation with the guests. A favorite episode of mine so far is with '90s MTV star Julie Brown, talking about her career and showing the best clips of her career. How great is "Homecoming Queen's Got a Gun?" You may know Jake Fogelnest as a teenager from his MTV show Squirt TV, a DJ on Sirius XM, a talking head on the I Love The _____ shows, and from the internet. He's a force to be reckoned with on Twitter, and seems to know everyone, not because he's a fame chaser, but because he's just an all-around NICE guy who loves to chat about movies, TV, music, books... everything that a true pop culture geek loves. He's like the friend you go to midnight screenings with and challenge each other by trying to name the most obscure episodes of Family Ties. (I mean, that's what I do with my friends. I thought everyone did that.) He has a fantastic way of engaging guests and bringing up obscure anecdotes about his adventures with celebrities at age fourteen. When I tell people I love pop culture, I think they often assume that I mean that I love watching TV, movies, and celebrity gossip. Which I do, but there's more to it than that. I love pop culture as a reflection of society, and each piece represents a reflection of society. I like the discussion it promotes. Reminiscing about an old show with someone can create an instant connection and instant sharing of values, childhood, and other things that typically don't come with other small talk. I believe that Jake Fogelnest shares the same love for pop culture, and seeing him put his vast knowledge to use makes me happy to know that there's someone out there that loves pop culture even more than I do, and is putting that love to good use. I've followed Emily Heller's standup career when I saw her set accidentally as an opener to a variety show, and I'm glad to see that she's jumped on the podcast bandwagon. Her show is certainly funny, but is set apart from other comedy podcasts in its focus. Her show focuses on learning new and weird knowledge, and has guests on that share their knowledge about a particular topic. However, these guests are far from academicians, but still have some great knowledge to bring. I applaud their choice of guests, some of whom are more well-known while others are writers, artists, or other interesting people from their lives. 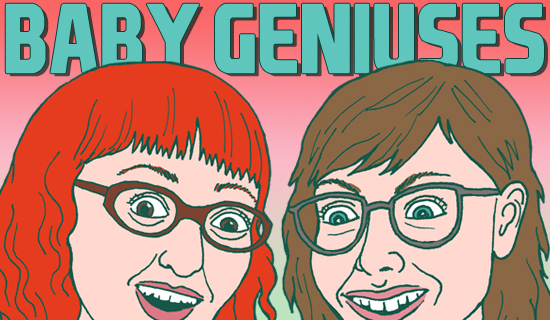 Segments include "Wiki Of The Week" where Emily and Lisa review a Wikipedia page. Heller and co-host Lisa Hanawalt complement each other well, with Lisa being more reserved (i.e., she's not a comedian) to Emily's more outspoken personality. The great thing about Emily Heller is that she is incredibly funny and her standup routines can go into bizarre territory, but as "herself" she's just the right mix of honest, down to earth, and even open enough to share some of her vulnerabilities. Now on its fifteenth episode, I’m excited for Baby Geniuses to really start taking form.